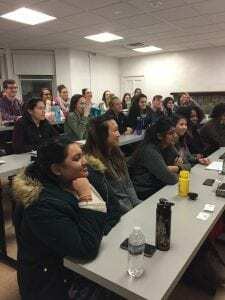 Donna Appell, President and Founder of the Hermansky-Pudlak Syndrome (HPS) Network, and her daughter Ashley Appell, spoke to a class of soon-to-be genetic counselors at Sarah Lawrence College in early December. The focus of the class was genetics in pediatrics. Donna Appell spoke to the students about the value of non-profit patient organizations as referral agencies. She spoke about the resources organizations, such as the HPS Network, can provide to counselors, as well as their patients. Not only do non-profits like the HPS Network provide emotional support, but they also can provide ongoing information about standards of care, research and new treatment options. Their perspective can identify useful resources that might otherwise go unidentified. Ashley Appell spoke about the challenges of transitioning to adult medicine with a complex genetic disorder.